Struck between middle of 10th century to beginning of 11th century. The Persian H, the initial of Haider, is the identifying mark of the issue. 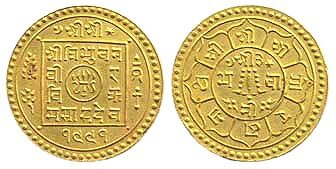 The type was derived from the usual issue of Sadasivaraja of Vijaynagar, and follows the same weight standard, which was retained with remarkable accuracy throughout the Mysore series. The type was a conscious revival of a pagoda of Vijaynagar struck by Krishna Raya Deva. 532. Awadh, Saadat Ali (1798-1814), Mohur, Luknow, AH 1228/26, ex mount, 10.6 gms. 534. Jodhpur, Mohur, in the name of George VI & Umaid Singh, with nagri Gau, x/11, 11.2 gms. Rare with date. 538. EIC, Panchia (5 Rupees or 1/3 Mohur), Surat, Star and crown mint mark, AH x/4, 3.8 gms (KM#267). These coins were struck between 1825-1831 AD. 541. 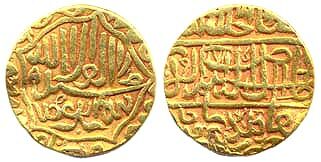 Round Token with Mughal legends of Akbar, 10.7 gms. 544. Kshatrapa, silver, with legend 'Rajano Mahakshatrapa, 2 gms. 546. Yadava Kingdom, King Mahadev, silver fanam, 0.9 gms.